Nautilus: North East: Bug Squad, Maxilash, Captain Nemo, Nemo’s Nemesis, Auto Supply, Horticulture, Cannonball and other exceptional climbs are located here. North Central: Mainly the Cool Hand Luke Area, the Tongue Depressor and ‘Old Eyeful’ on the Upper Tier.. YES, that’s someone rapping off of the “tongue” !! North West: Upper and Lower Slot, Hairlip, Cornelius, Nitrogen Narcosis and other climbs are found here. You can also see part of the West End (not shown completely yet). This is where Finally, Drunken Redneck Rapellers and a westerly view of Ted’s Trot Block is found. 2.) Outrider 10a A three bolt face climb is found here. **Check out what some of the seasoned hard guys have to say about this end of the Nautilus, sometimes harrowing, sometimes hilarious, but always informative ….. GO HERE. 8.) Grand Traverse 10c (in the shade on photo topo above) Described on Nautilus N E End. 9.) A new bolted route, details later. DESCENTS: Rap off 2 sets of anchors on NE end as indicated on topo. This is the far east end of the Nautilus, also commonly known as the PROW. 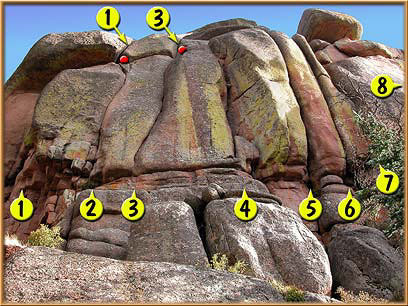 Numbers 1 and 2, not associated with the PROW, have been added for orientation purposes. BRING LOTS OF TAPE, BIG PRO AND PUMP UP BRO! 1.) 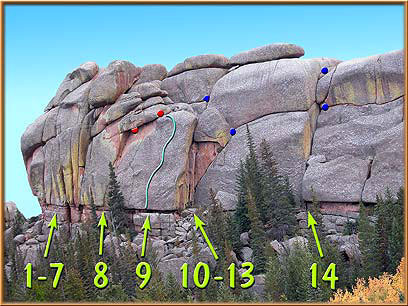 Grand Traverse 10c 2 pitches (1st = 10a) Just to the right of the Right Torpedo Tube under a huge capstone. 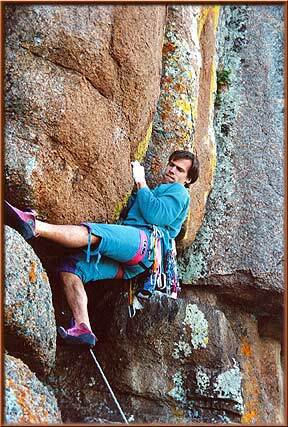 The original climb: (P1) Start up a fairly continuous hand crack splitting a blocky face. It will jog slightly right about 2/3rds of the way up to the capstone. 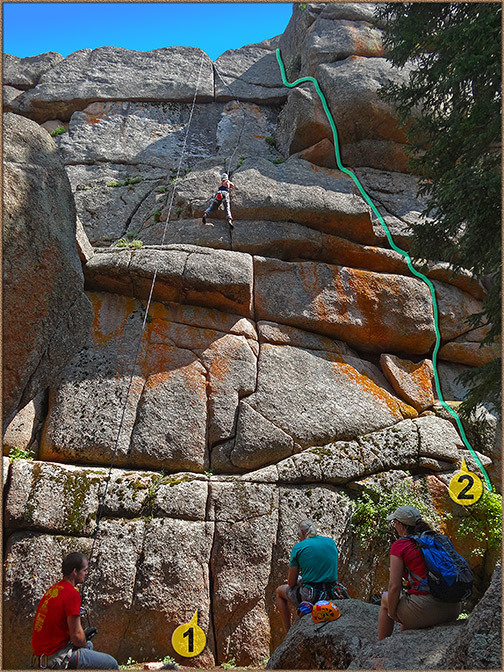 Traverse right under the capstone (at the arrow) and come to a set of belay/rap anchors near a vertical crack. Rap off here or do the second pitch. 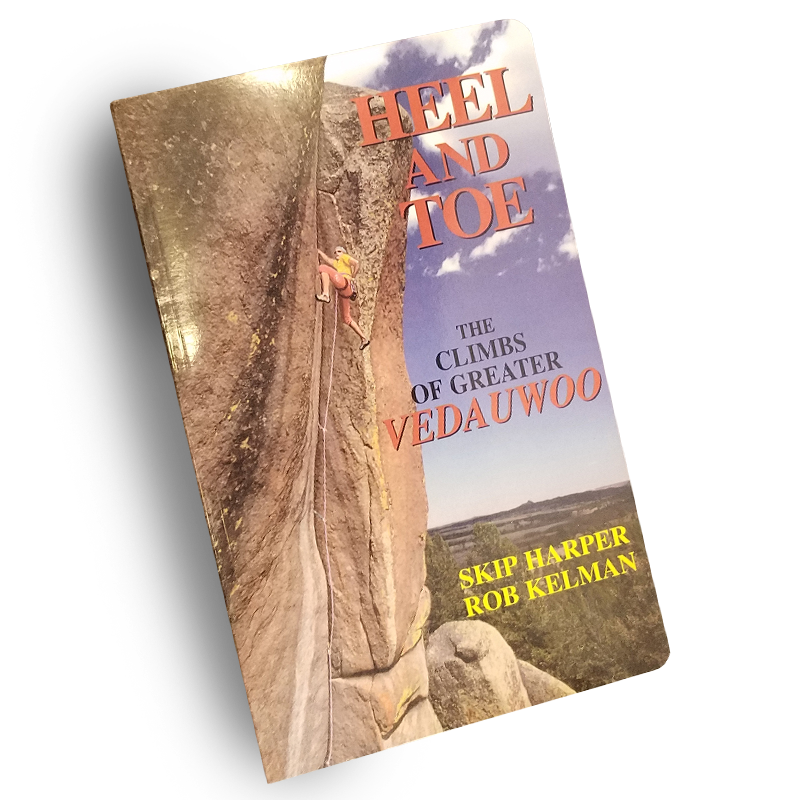 (P2) Follow the ‘Grand Traverse” continuing clear over to the top of Nemo’s Nemesis, tie in and belay..A 60 M rope will get you down from here. (McClure and Fowler, c 1970). 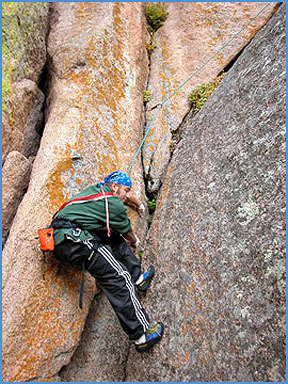 An alternate second pitch ascends the fist-sized crack over a bulge (10c crux) near the first belay. 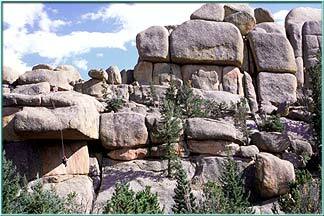 Descend the MPSpace raps (ne top, see Prow topos) or long walk off to the west. (Matous and Cairns, 1974). * Seen in the 3rd and 4th image directly above. 10.) The Driver 11c The most ‘outside’ crackline is a whipper…..especially when you find the crack diminishes to nothing. Make the dicey transition into #11 for the exhaustive finish. 13.) Horticulture 6 Usually 2 pitches with a belay after the first right-slanting crack (before going up and left – at arrow on topo), or use good rope engineering if you do it in one pitch. (Ray Jaquot and Nancy Cowley, ’71). 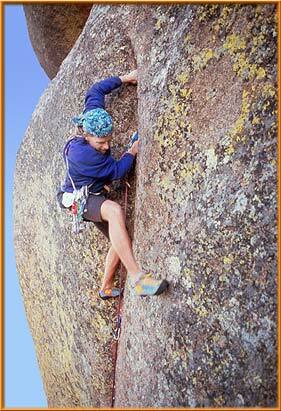 The 4th photo directly above is of Nate Jorgenson from UWyo on the follow of this cool climb on a cool, cloudy day. Buried in the depths of a dense forest, approximately midway along the base of the lower tier on the northeast side of the Nautilus, one finds the Cool Hand Luke Area. It can be approached from either direction, ie around the Prow (NE) end of the formation or directly from the parking lot on the southwest end. The descriptions of these approaches can be tedious. 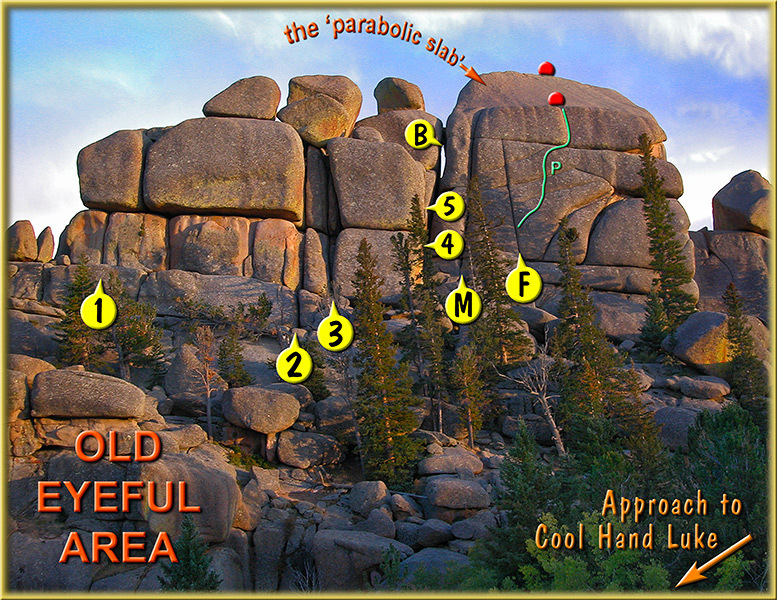 If you’re coming from the SW end, just keep heading (NE) along the base of the formation past climbs that are easily identified like ‘Slot’, ‘Mother #1’, ‘Cornelius’, and so on. You will find a trail that drops down into a miniature valley and soon you will see a gigantic roof called the ‘Tongue Depressor’ looming overhead. You’re almost there. 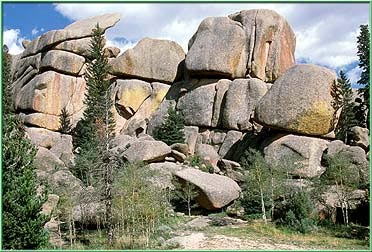 ‘Cool Hand’ is about 50 yards further along, just before a large, 15′ high flake is seen leaning against the main formation. Coming from the Prow (NE) end, you’ll just have to bushwhack it on beyond the Horticulture Annex and past Cannonball (about 100 yards further), staying within sight of the base of the formation. Find the large flake leaning against the main wall with a large space (almost a cave) behind it and you are essentially there. Is all the work worth it? Probably so. There are at least 5 climbs associated with the area, each of which is a ‘different ride’. It is always shady here, so ‘cool hands’ is the name of the game, especially in the mornings. ‘Cool Hand’ is also a great escape from the mid-summer heat, but there can be mosquitos, so be forewarned. BELAYS are on gear. (** Hmmm, seems like someone put up at least one set of RAP ANCHORS in the late nineties.) DESCENTS via gear or anchors for the next climb – or lengthy walk down to the right. Kelly having fun TR’ing ‘Failure to Communicate’ (#1, 10a). 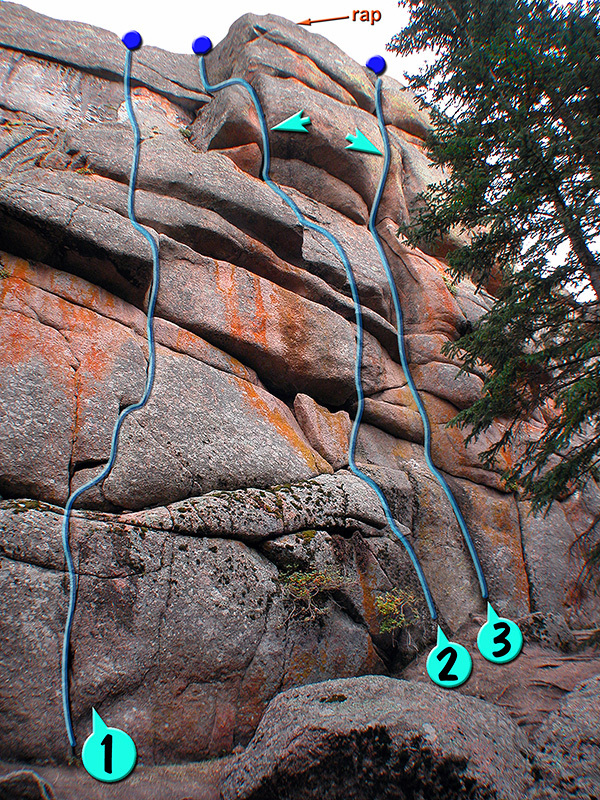 #2 is ‘Dragline’s Demise’ (10a). 1.) 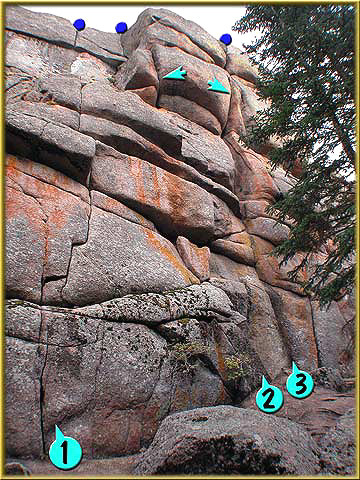 A Failure to Communicate 10a Follows a discontinuous crackline through 3 minor ledges to a large flake, and on to a crack that leads to the top. Short rack. (G. Waterman et al., ?). Surely Kelman et al., climbed it early on. 2.) Dragline’s Demise 10a *NEW ROUTE – indicated with blue-green line. 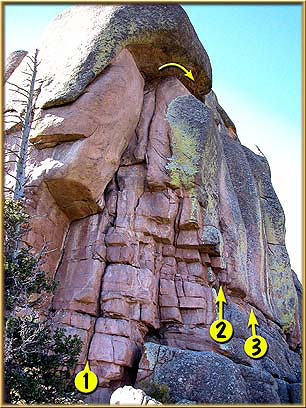 Begins up a blocky face, over minor ledges to an overhanging bulge (crux – arrow). Continue up a finger and hand lieback crack to the top. Short rack. (Harper and Diamond, ’93) *NOTE: Overlooked in newer guides Kelman,’04 and Orenczak, ’03 and ’11. TOO BAD, it’s a cool climb. 1.) Old Eyeful 7 Climb an easy finger crack to a ledge with a big block above. Find an interesting ending towards the south. 2.) Dual 9 This one has two parts. 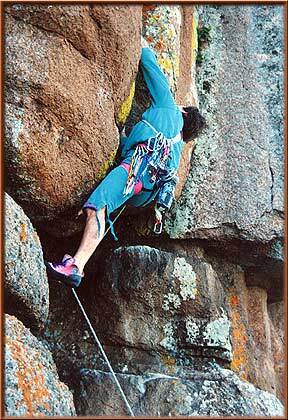 First a short hand crack (about 5.7) to a ledge and belay (only about 30′). 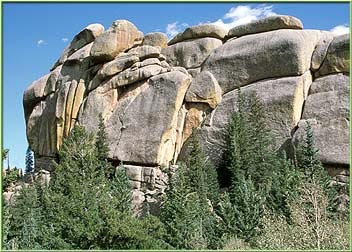 Then go back into the declivity and continue up on jamming and stemming (about 5.9) to the top. 3.) Humper 8 Wallow up the chimney to the right of ‘Dual’ to a shelf and hump up the ‘left’ off width, stemming near the top. 5.) Kiai 8 A deep slot with a flake within is found to the immediate left of ‘Baldwin’s Chimney’. Take the left side of the ‘flake’. DESCENT: There are two sets of rap anchors on the top of the ‘block’. 7.) Cornelius 5 Seen in photo at top of page. One fine little climb at the grade using mostly fingers and some hands. Great practice for placing pro. 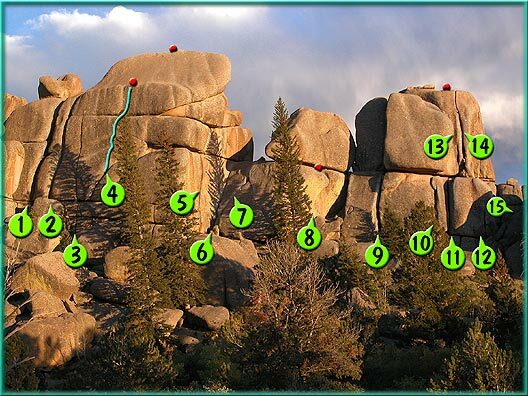 I think someone put in anchors at the top, but the big boulder takes pro (for the belay) as well. 10.) Lower Slot Left 7 Mostly hands at a modest grade. 11.) 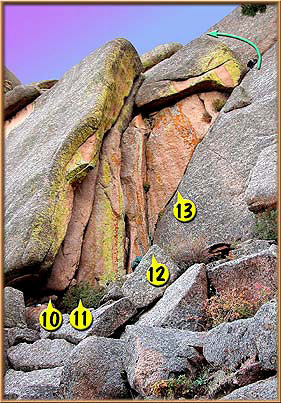 Lower Slot Right 8– There are teeth in this moderate off width. Tape recommended. 12.) A Little On The Ugly Side 10a Move up an awkward off width and head across into the scoop. There are two bolts here. Finish on the ledge above. 13.) Upper Slot Left 10b Fairly difficult OW start and dumbs down into stemming. 14.) Upper Slot 8- Gotta do it…… everybody else does. Perhaps the most sought after OW at it’s grade. Bring a couple of big cams for sure. Afterward, you can join the multitudes that either support or dispute the grade to the point of retardation. Unbelievable. 15.) Stand and Deliver 10a Follow a line of three bolts to stand and deliver the finish. A little runout. DESCENTS: There is a wide chimney with easy access up or down about 15 feet to the west/right of Nitrogen Narcosis. Also, several routes have top anchors. 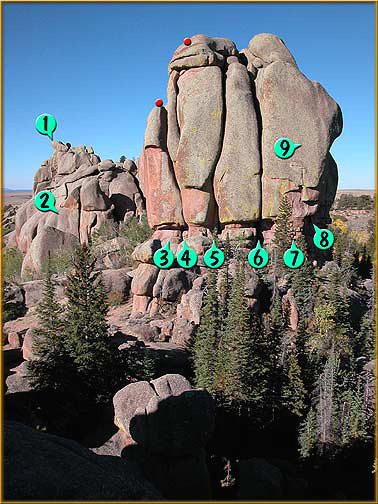 You can also access the South Side of the formation by downclimbing to the rap anchors on the Practice Slab.